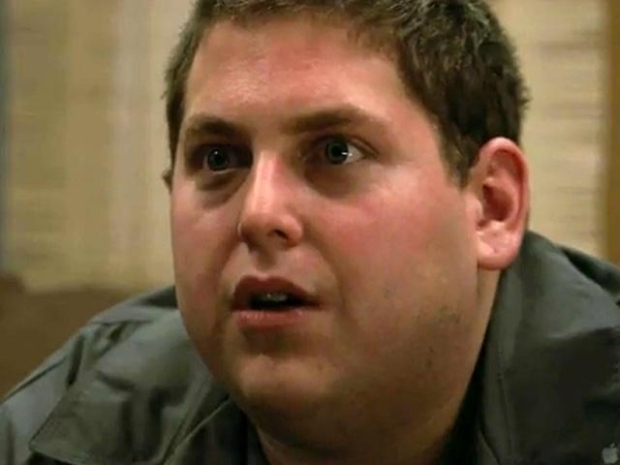 "Cyrus," from writer-directors Mark and Jay Duplass, finds Jonah Hill making a very successful move toward drama, John C. Reilly taking on a too rare leading-man role and Marisa Tomei doing some of the best work of her career in a well-crafted character piece centering around three adults in a very unhealthy relationship. The film opens with Reilly's character, John, being caught in a most compromising position. The dirty laundry and dishes strewn about and the state John's in when we meet tell us pretty much all we need to know about him -- he's a pathetic mess, both inside and out. John is soon arm-twisted into attending a party where he proceeds to get drunk and is humiliated by the homeliest woman there. Yet he soon finds himself flirting with Molly, (Tomei), an unlikely turn of events considering what a knockout she is. He even asks her self-deprecatingly what she's doing talking to "Shrek." It quickly becomes clear why a woman like Molly would talk to a man like John: she's got a 21-year-old son, Cyrus, who was home-schooled and has never left home, not exactly an aphrodisiac to the average man. The bond between Cyrus and Molly strains the boundaries of appropriateness, with the son asking/telling John, "Seriously, don't f*** my mom," and assuring his mother he wants her to find someone to "love her in a way that I can't." The Duplass Brothers wrote the part of John specifically for Reilly, even telling the studio they wouldn't make the film without him. Their insistence pays dividends as Reilly's innate likability makes you root for him to essentially come between a mother and her child. After repeatedly giving Cyrus the benefit of the doubt and then bending over backwards to peacefully co-exist, Reilly declares war -- the whole story would fall apart if you no longer like John. Hill's performance comes as a pleasant surprise after a career that thus far has seen him do mostly sophomoric comedy, e.g. "Superbad." He's done it very well, mind you, it's just not the sort of resume that would make him come to mind for a role like Cyrus, one that demands he walk such a fine line as a manipulative young man trying to drive a wedge between his mother and her boyfriend. Between "Cyrus" and "Get Him to the Greek" (which we throroughly enjoyed, depsite a pear-shaped ending) Hill is having a great month, box-office returns aside. But it's Tomei's performance that stands out. During that first dinner with both her John and Cyrus, you can watch as her face contorts, twists and stretches in response to each thrust and parry between her two suitors. While the motivations and desires driving Reilly and Hill are clear, Tomei is trapped at the hinge of this very uncomfortable triangle, forced to navigate a path that's best for her without betraying her son. Michael Andrews, best known for his cover of "Mad World" from "Donnie Darko," provides the score, a beautiful array of guitar lines that never get in the way of the mostly improvised dialog, for which the Duplass Brothers' mapped a smooth story arc with only are missteps. Mark and Jay made their bones as members of the mumblecore movement, crafting low-budget films focused on personal relationships, and they manage to scale that approach up to the world of studio film-making without losing their footing. After what the three protagonists have been through, there can't be any tidy ending, and the story draws to a close in an honest fashion that doesn't insult the characters' story or the audience's intelligence. From directors Mark and Jay Duplass and starring John C. Reilly, Marisa Tomei and Jonah Hill comes the story of a man who finds himself fighting for his girlfriend's attention with her 21-year-old son.